Maurice immediately rushed from the lane, returning home to call the police and report the gruesome find. Somehow, despite the body being naked, perhaps due to shock, Maurice incorrectly identified the body as that of a man to police. At this point, the police did not suspect the death to be suspicious, they negligently assumed that the body was probably a vagrant or a drunk who had died of exposure in the cold February night. This perhaps explains why the first police officers to eventually arrive at the scene were two traffic policemen who happened to be in the area. Unpractised in a murder case, unfortunately, the two traffic policemen did not preserve the crime scene or follow the forensic protocol that was required. At approximately 8am two detectives, Detective Sergeant Andrew Johnstone and Detective Constable Norman MacDonald, arrived at the scene. It was clear to the detectives that the circumstances surrounding the death were suspicious, there was no sign of any clothing surrounding the body save for a pair of tan sling-back shoes that were located nearby. Also located near the body was a used sanitary towel. The detectives observed dark bruising on the woman’s neck, suggestive of ligature strangulation, as well as various cuts and bruises indicating that the victim had been violently beaten. It took almost an hour for the crime scene to be locked down and for crucial evidence preserved, Detective Superintendent Elphinstone Dalglish ordered the erection of a tent to preserve the body and allow for closer examination of the remains. A mobile police caravan was set up on Ledard Road to serve as a point of contact for concerned local residents who were already flocking around the scene. The police surgeon noted the ligature marks and pronounced the likely cause of death to be manual strangulation, he also noted that rigor mortis had set in but determining a time of death was complicated by the heavy frost which would have speeded up the lowering of body temperature, he could only say with confidence that the woman had been dead for some hours. The press soon swarmed on the scene, and, to their credit, did what police should have done hours before and began canvassing neighbours in the hope of identifying the murdered woman, forcing the police to intervene and demand that the press stop in case it harmed their own investigations. Almost two hours after the discovery of the body, the police’s own door-to-door enquiries began, and it soon became apparent that no one had seen or heard anything. The crime, if it had happened where the body was found, seems to have occurred in absolute silence. The police assumed the body to be of a local person, but the house to house enquires revealed no missing or absent residents from any of the surrounding streets. News of the gruesome find was the talk of the area, and soon spread to the nearby Victoria Infirmary, where staff discussed between themselves whether the body could be that of a wandering patient or a hospital worker. Two nurses, Matron Ishbel Cameron and assistant Matron Elsbeth Bissett viewed the body but were unable to identify it, later an ambulance driver viewed the body and told police that he recognised it as a nurse from the hospital but was unable to give police a name. At around 12pm the body was removed from the lane, with police no closer to an identification. A post-mortem examination confirmed the manner of death as strangulation, she had also been raped and viciously beaten before her death. It was also confirmed that the discarded sanitary towel found near the body belonged to the victim, doctors believed it had been removed by the killer before he raped her. With door to door enquiries still on going, a woman who lived nearby reported that she’d heard screams in the early hours of the morning: ‘I heard a woman shout out, twice in quick succession “Let me go.’ It was brief and I never heard it again. I thought nothing of it at the time. It was not followed by any kind of screams or any sort of commotion really…It all happened so quickly.’ While this statement didn’t offer up any real information as to the identity of killer or victim, it did, if it was correct, suggest that the murder did occur in the lane, and that the lane was not merely where the body was dumped. Devoid of any other options and no closer to identifying the victim, the police released a description of the victim to the press: Medium height, short, dark brown wavy hair, hazel eyes, snub nose, wearing a wedding ring on her right hand. John Wilson (63) of 29 Langside Place (less than one minutes’ walk from the crime scene) read the description that day in the evening paper. He lived with his wife Pauline, their daughter Patricia, and Patricia’s four year old son Sandy, and for a moment he considered the whereabouts his daughter Patricia who had gone out for the evening and had not yet returned. Although he was concerned, he knew Patricia was a sensible girl and supposed that she was still with her nursing friends who she said she had gone out with the night before. After discussing his worried with his wife – John made his way to the Ledard road incident caravan and informed police that his daughter, Patricia Docker, had not returned from an evening dancing the night before. 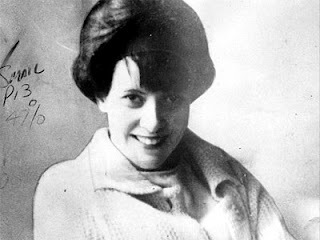 He had taken a recent photograph of Patricia with him, but due to the intensive facial bruising on the body an identification couldn’t be made, he was asked to view the body at the morgue instead where he recognised the body as that of his only child, Patricia (25). It was revealed that Patricia and her son Sandy had been living with her parents at Langside Place since returning from Cyprus in 1967. She had separated from her husband Alex, an army corporal, who was now living in Lincolnshire. Patricia was an auxiliary nurse at Mearnskirk hospital, who usually worked nightshift. 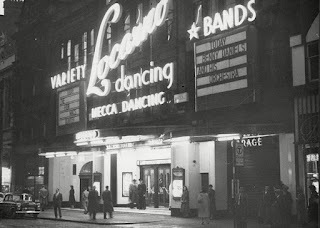 On her days off she was a keen dancer, a regular at the Locarno, the Majestic and the Barrowland Ballroom. 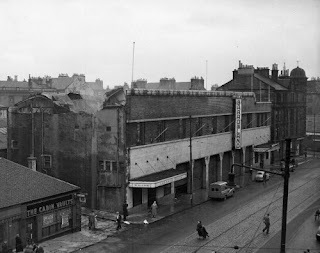 Her parents believed that on the previous evening she had gone with some friends to the Majestic Ballroom on Hope Street. She had left around 8.30pm wearing a mustard woollen dress, a grey duffle coat with a blue fur collar, and brown slingback shoes and carrying a brown handbag. Police immediately suspected Patricia’s ex-husband of the murder, the fact that the serviceman had been on annual leave at the time of the murder strengthened their suspicion. However Alex Docker was able to prove that he was elsewhere at the time of the murder. Nevertheless, Police now had the information that she had spent the Thursday evening at the Majestic Ballroom to work from, and issued an appeal for fellow revellers to come forward with information. Police began to believe that Patricia had been driven from the ballroom to the lane by her killer, as there were no sightings of her on any public buses that night. 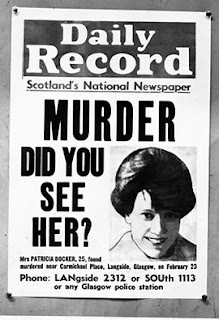 Furthermore, the fact that all of Patricia’s clothing had been removed from the scene suggested that the killer had a car, as surely a man carrying a bundle of women’s clothes, including a hand bag would be noticed walking through Glasgow. Officers were dispatched to search local yards, bins, garages and rivers in search of the missing items. In the murky depths of the river Cart, officers found Patricia’s bracelet, part of a watchcase, and her handbag. Police canvassed the Majestic ballroom, speaking to everyone who attended the following week. Armed with photographs of Patricia, they interviewed management, door staff, cloakroom attendants as well as patrons. A blown up picture of Patricia was shown on the ballroom’s screen, and a police spokesperson spoke on stage and asked for assistance in tracing Patricia’s killer. However, despite their best efforts, the police’s hunch that Patricia had remained at the Majestic all evening was mistaken. 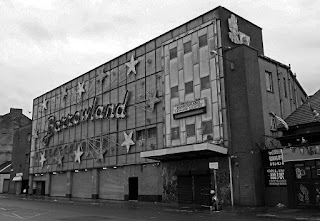 A witness who knew Patricia said they had seen her dancing at the Majestic but that she had left when it closed at 10.30pm to go to the Barrowland Ballroom which was open until midnight. This information meant that police had lost valuable time canvassing the majestic when it seemed likely her killer had picked her up at the Barrowland instead. 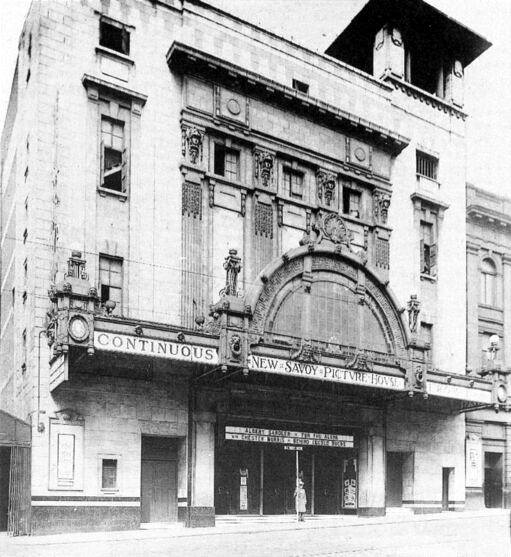 Later the witness who said he had seen Patricia that night at the Majestic retracted his statement, saying he had been mistaken, it was another night, this, coupled with other witnesses placing Patricia at the Ballroom earlier than 10.30, led police to believe that she had never been to the Majestic at all that night. 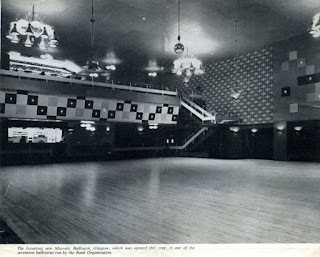 Several people came forward to say they had seen Patricia dancing with several men at the Barrowland, and that one of the men had light red hair, but this was little for police to go on and soon the trail went cold. 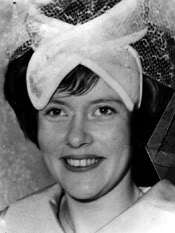 Gradually press and public attention fell away and the police investigations ground down, until, that is, another woman was found murdered after an evening’s dancing in August 1969.